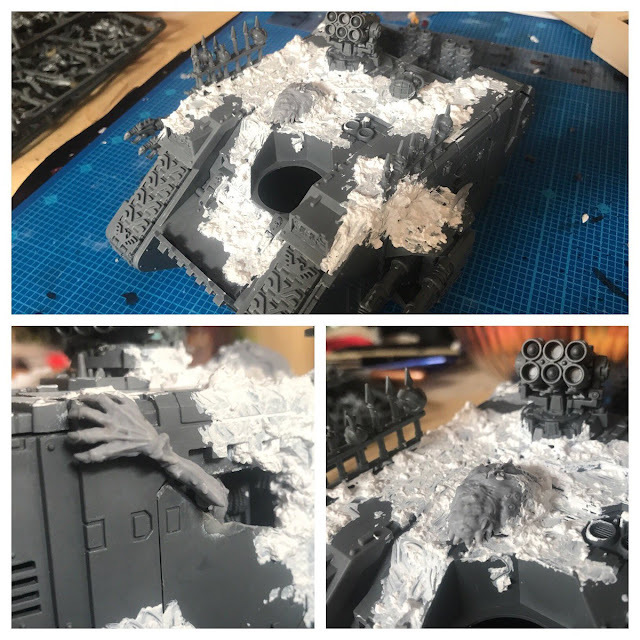 The best part of starting a new 40k army for the new edition is getting to explore a totally new aesthetic. As I mentioned last time out for me this has involved creating a Death Guard force. 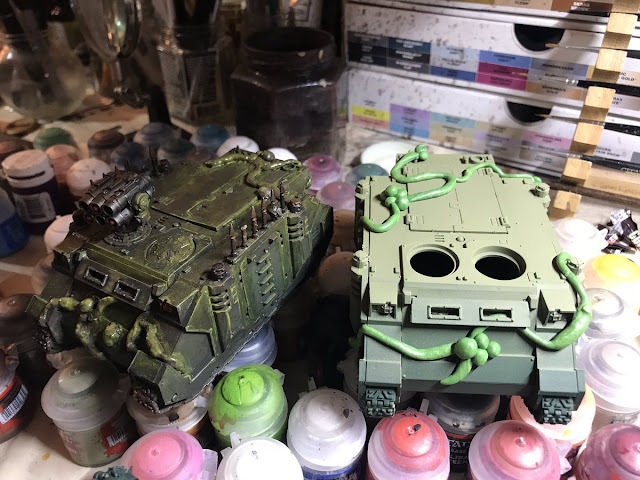 That means I get to explore what it means to make vehicles 'feel' like they belong in a Nurgle army! 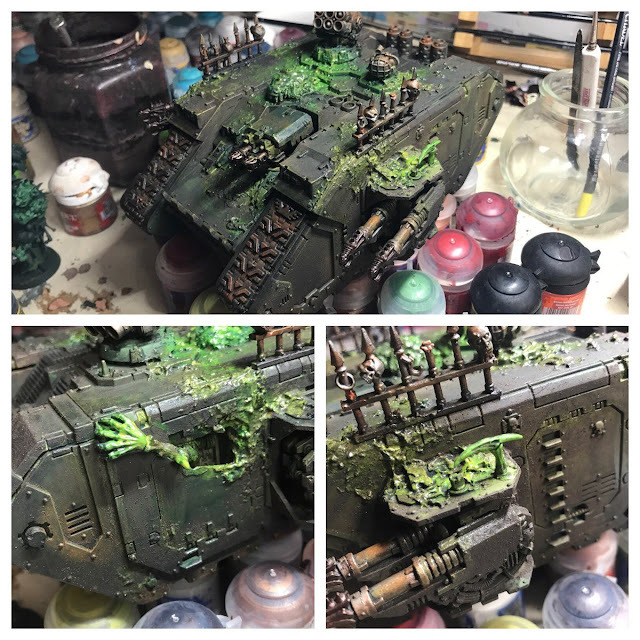 It means some plague and decay vehicle style! I didn't get any in progress shots of the first effort. I wanted to make two Rhino conversions, and this was the first. I used the same rush technique as with the Bloat Drones previously, but then when it came to the main body I went over the body with a rough application of Typhus corrosion, and then did some edge highlighting with a combination of Nurgles Rot and the new Death Guard Green. The technical paints really helped to sell this effect. I liked the final result, so went with it again with the second Rhino. I added some simple tentacles and pores with green stuff for some added effect! 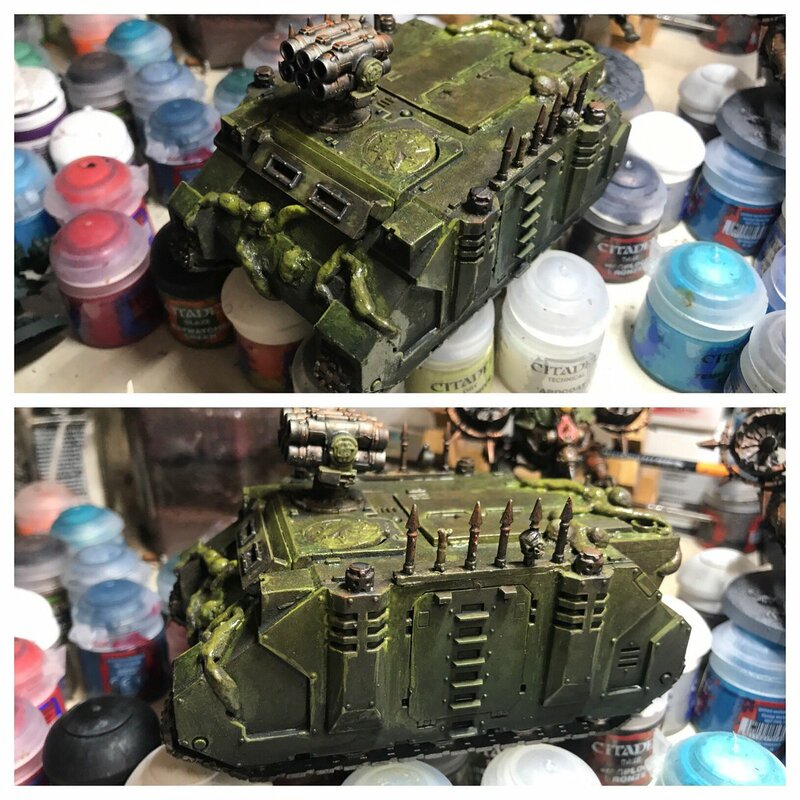 The final result on the second Rhino. 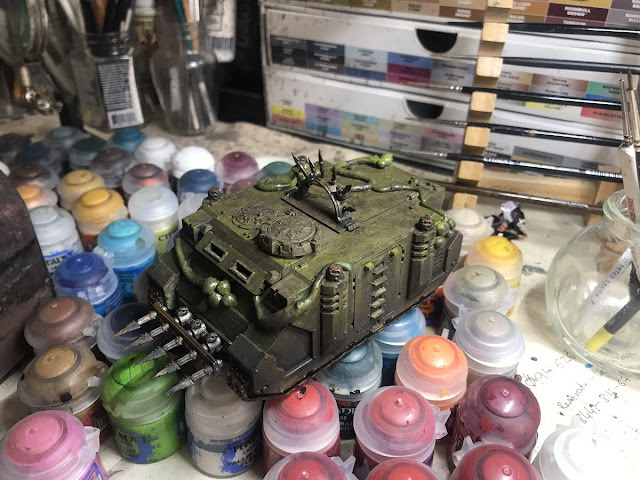 Next up I tackled a Land Raider. I wanted to stick to the main scheme, but do something different this time with the 'nurglification' as it were! So this time I used some modelling putty and created a texture for the surface that I wanted to 'spread' out from a spore of sorts on the central chassis. Then I added some touches with some extra demonic arms and claws. Paint wise I gave it a two tone undercoat. The bottom half is undercoated with Caliban Green and then the top half with the new Death Guard green. Then I picked out the spored area with Moot Green and added a mix of Camoshade and Greenshade washes to pick out the decay. 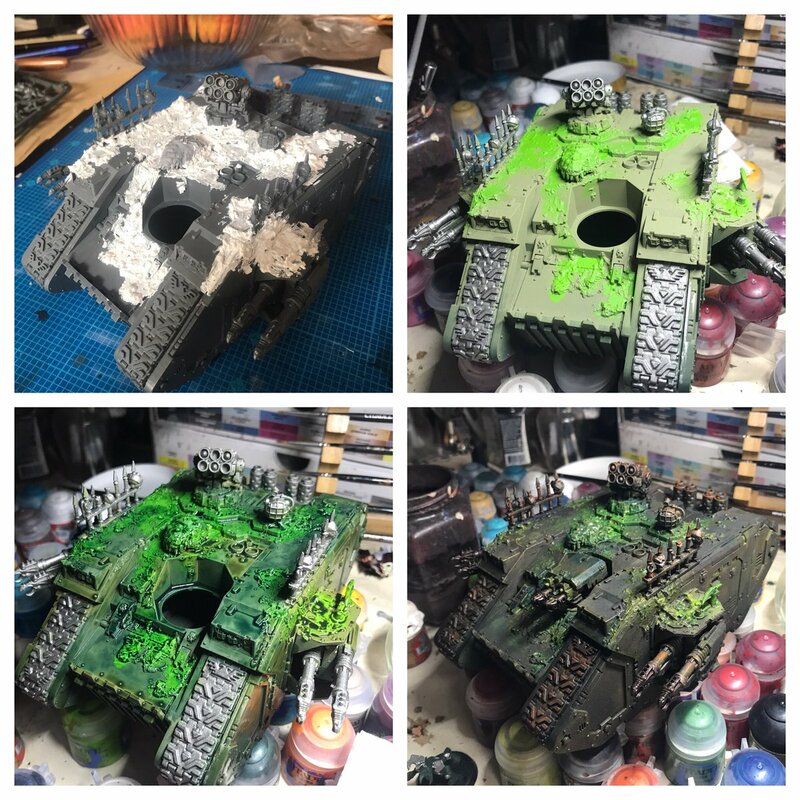 Once that is dry I add another wash layer of camoshade to bring it together and then repeat the process form the Rhino's with the Typhus Corrosion and Nurgle's Rot. The finished model is suitably 'Nurgled'! The only 'problem' with these results is that I have now order an Imperial Knight kit that I intend to turn renegade with another 'Nurglification' in mind!